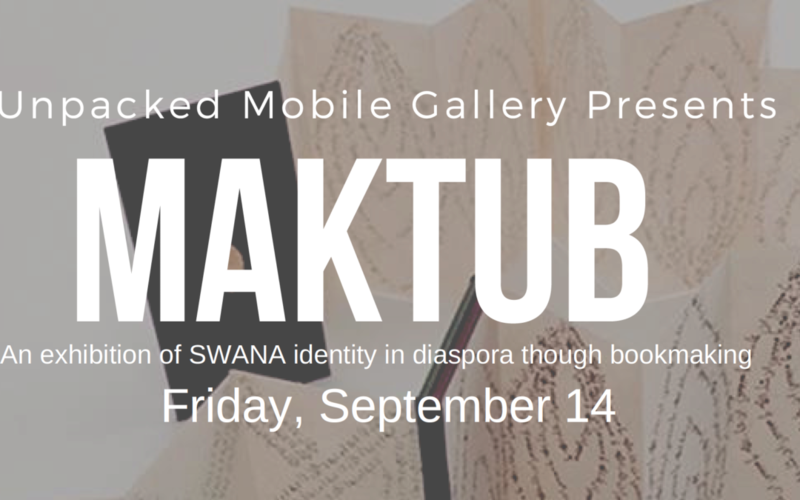 Unpacked Mobile Gallery presents Maktub, a three-person exhibition by Lamia Abukhadra, Essma Imady, and Zeinab Saab, Friday, September 14. 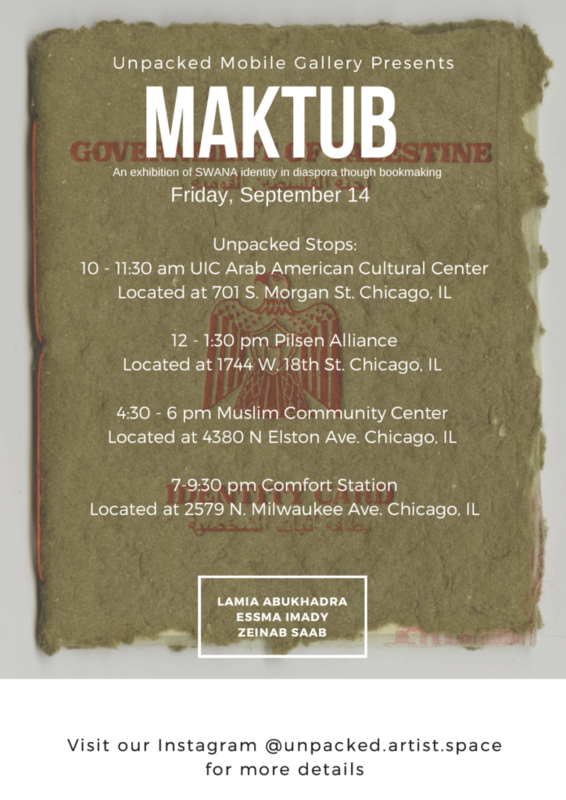 Maktub is an Arabic word that translates to “it is written” and the the exhibition deals with the history of three Arab women living in the diaspora, and their relationship to their native lands – Palestine, Syria, and Lebanon – and the importance of preserving their history and culture through the art of bookmaking. The exhibiting artists are Lamia Abukhadra, who is of Palestinean descent, Essma Imady, Syrian descent, and Zeinab Saab, of Lebanese descent. Support will be used to help with the cost of renting the truck and expenses related with traveling to the four cultural destinations over the course of this one-day pop up exhibition. Lauren Iacoponi and Shane Bowers co-founded Unpacked this past year due to a growing interest in different models of DIY exhibitions spaces, mobile museums and galleries for contemporary art. We wanted to mobilize in a literal way – bringing our vision out into the world and into different communities. Unpacked expands the domain of what is conventionally considered an appropriate space to showcase art – the bed of a moving truck. The DIY artist space exhibits innovative artists across disciplines through a mobile gallery or “pop-up truck show”, allowing for guerrilla art shows around the city of Chicago.